Equipment to make 3D pictures. The picture below is illustrating the stereo system I'm using in the field to make 3 D pictures. It is very flexible. 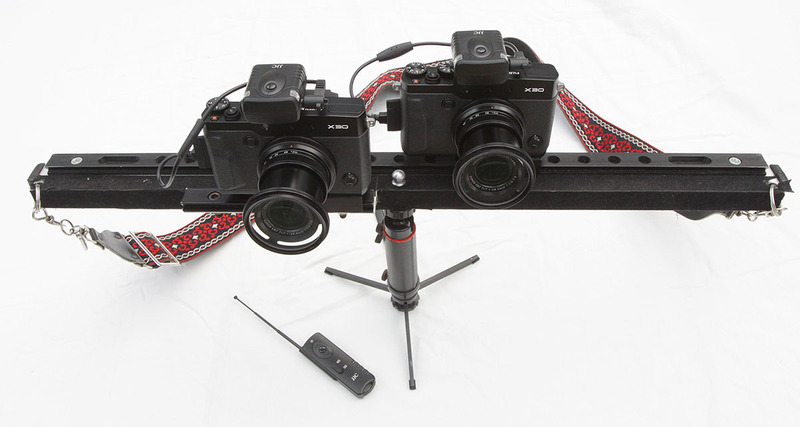 It allows making stereo pictures from a distance of about 2 meters to infinity. Two rails are mounted on an aluminum square bar with a handle to manipulate the system. 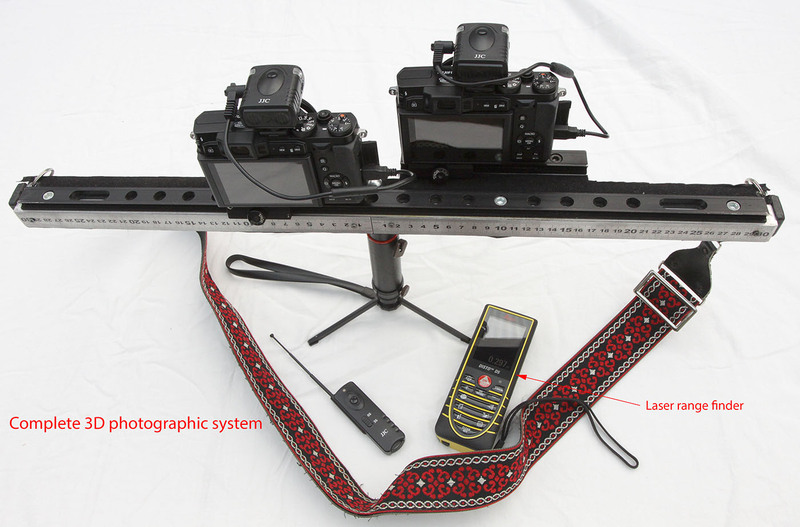 Two cameras can be moved on those rails with a separation between the optic axes of their lenses from about 8 cm to 50 cm. With the small rail in front, the right camera could slide slightly in front of the left one to reduce the lenses separation down to 8 cm. Otherwise, the objective lenses distance could not be lower than about 15 cm due to the camera size and the connector to the right. The small difference of depth between the scene to be photographed and the camera is negligible and is generally lower than the error due to the positioning of the zoom dial. The cameras used are Fuji X30 : they are small, they give good pictures. They have a manual graduated zoom which is very important to get the about same focal length for both cameras. The differences of the focal length inevitable with the zooms can be corrected with computers afterwards. I'm using the excellent software "Stereo Photo Maker". Both cameras are equipped with a radio receiver to synchronize them. It is very important to synchronize both cameras as close as possible if the subject is moving. The two Fuji cameras can be synchronized at 10 milliseconds. It works only for slowly moving objects. Two Canon 50D reflex cameras can be synchronized below 1 milliseconds. A laser range finder is used to measure the distance from the first object in the scene to be photographed. This front distance and an estimate of the back distance of the picture field of view (1000 meters for an infinite landscape) are used to calculate the separation between both cameras. Details of the rails supporting the cameras. The system described above can only be used for objects positioned at least at 2 meters from the cameras because the objectives distance cannot be lower than 8.5 cm. 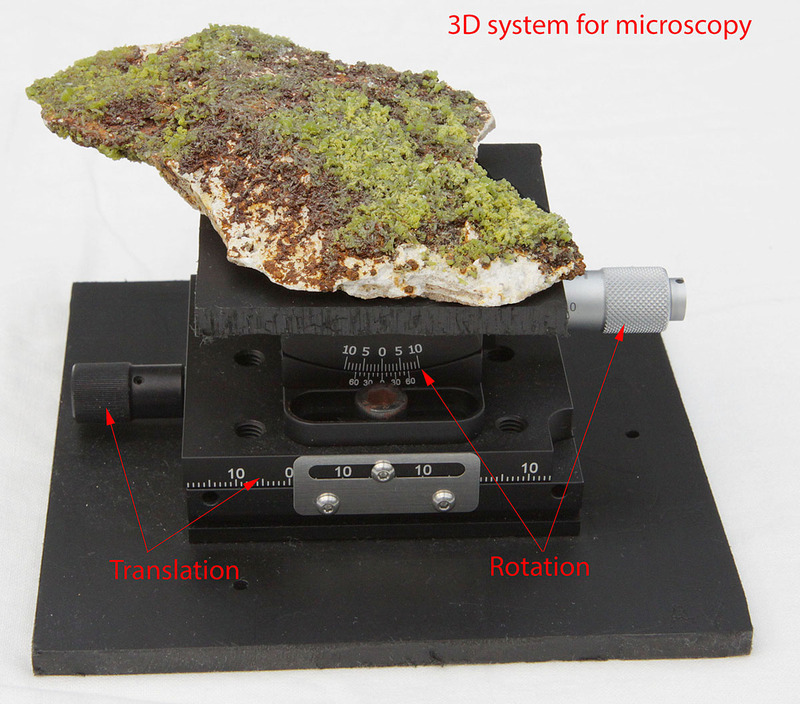 For macro photography, the system described below is used. The same Fuji cameras are positioned at 90° from each other and a semitransparent mirror reflects the light as indicated by red arrows in the picture below. The black panel prevents unwanted light to reach the cameras. With that design, the virtual lateral separation of both objective lenses can be zero. It is used for medium range macro photo. It is not possible to use the zoom at the wide angle position due to the limited size of the mirror. One of the camera should be shifted according to the front distance of the scene to be photographed. This can be controlled when looking trough the mirror ( blue arrow). 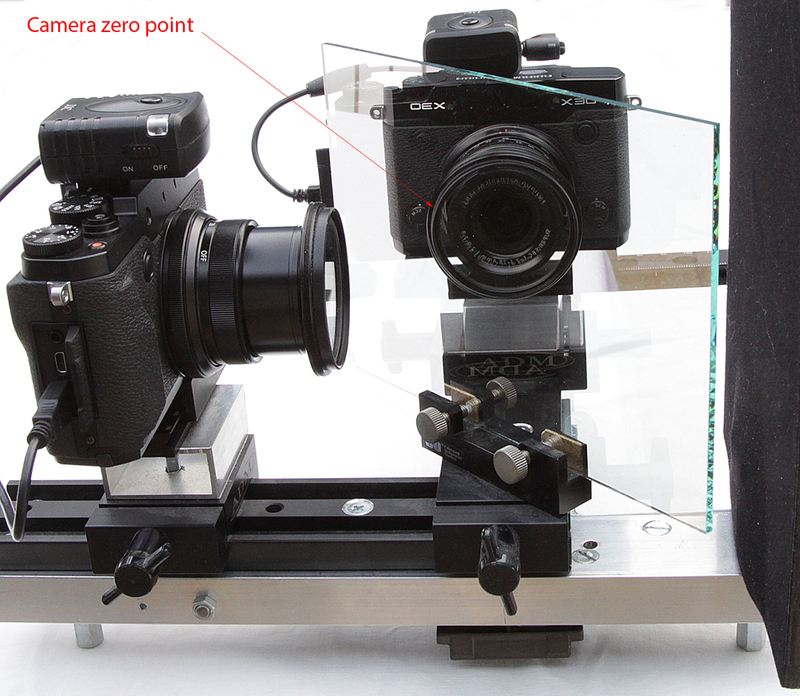 The zero distance between cameras is easy found by making the objectives images coincide in the mirror. 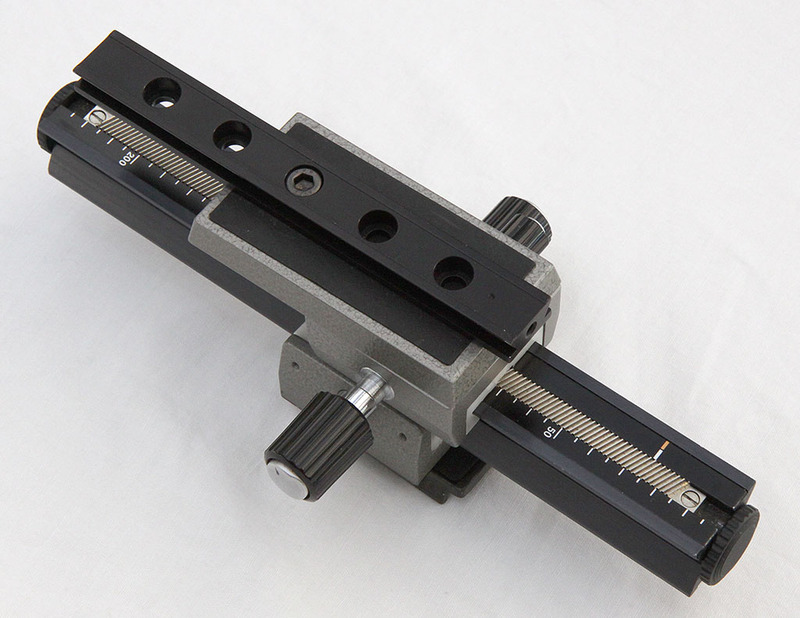 The small graduated rails come from Thorlabs, the larger dovetails and carriages come from ADM accessories for amateur astronomy, mirror and its support are from Edmund optics. 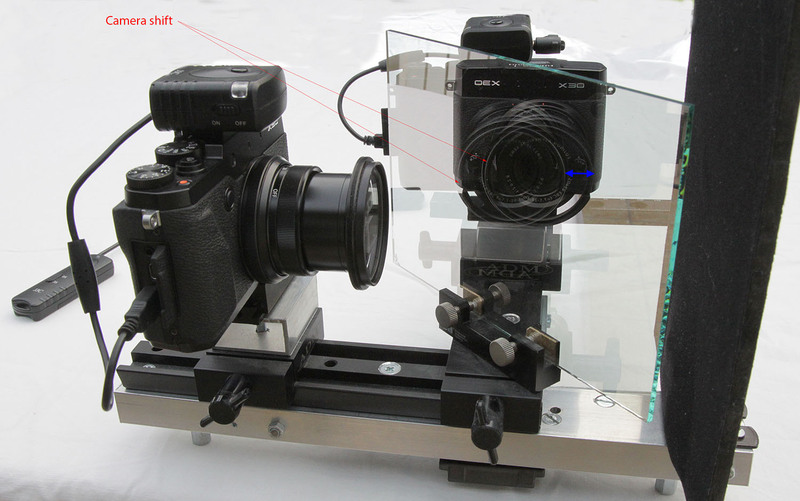 Here above is the simplest arrangement for 3 D photography. 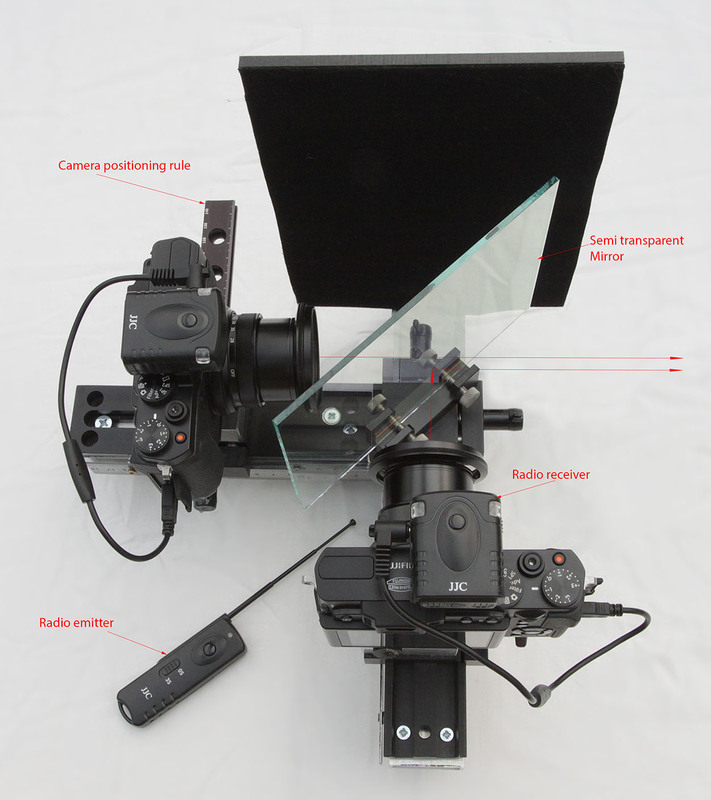 Only one camera is used, it is shifted manually with the knob. Of course the subject must be perfectly still during the shoots. The equipment is coming from an Olympus OM bellow. 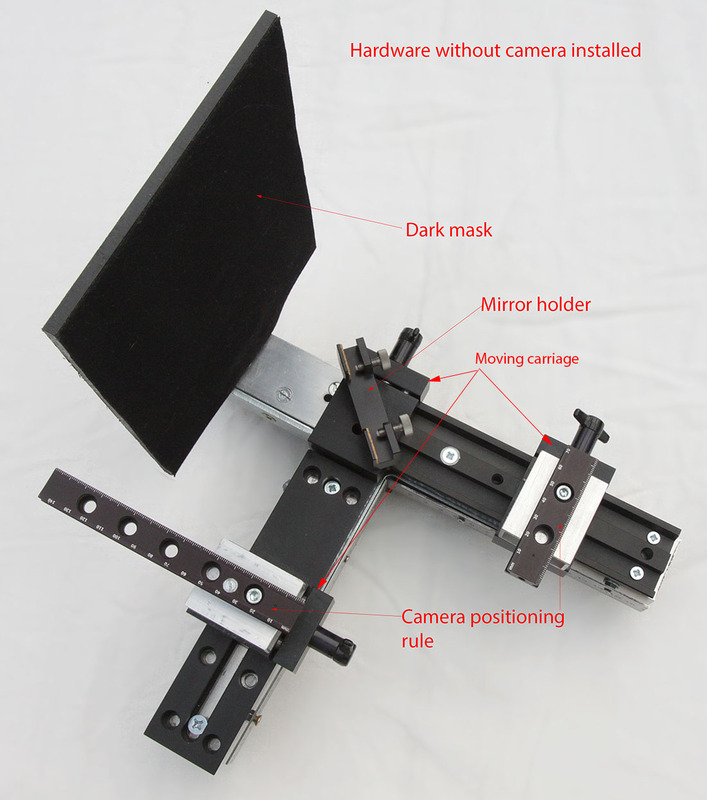 If the object to be photographed is too close, it is better to rotate the field of view instead of shifting the cameras. Above is a stage build with too Thorlabs components: the top one is a small goniometer to rotate the object by a few degrees ( 4 to 6), the bottom piece can shift the object laterally to keep it in the field of view of the camera. This stage can also be used with a microscope.